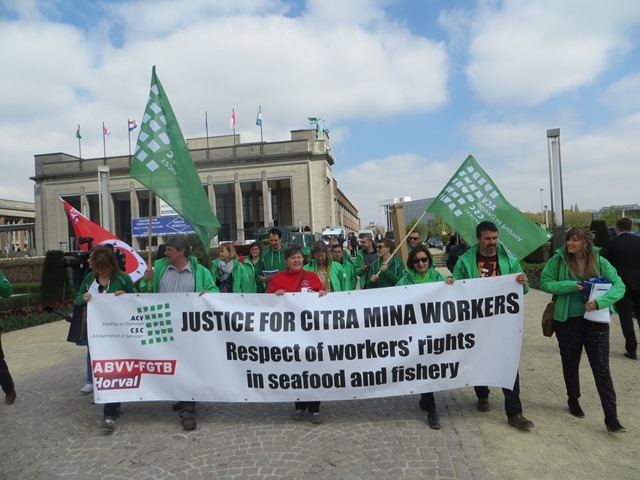 The IUF, International Transport Workers' Federation and Belgian unions CSC Alimentation et Services, FGTB Horval, and CSC Transcom raised the growing pressure on the Citra Mina Group at the Brussels Seafood Expo - the world's largest seafood trade fair -by demonstrating on April 23 outside the venue, where Citra Mina's Philfresh Corporation was one of the companies exhibiting and seeking contracts with buyers. Information on abuses by Citra Mina was also distributed to industry, retail and government representatives inside the Expo. IUF, ITF and their members are demanding reinstatement and union rights and recognition for 70 workers dismissed by Citra Mina for attempting to form a union at the Philippines' second-largest tuna exporter. Ahead of the protest action, a joint trade union delegation met with representatives of the European Commission to draw attention to the Citra Mina workers' struggle.